We knew that our New Year's Eve activities would likely change as parents, though to be fair we weren't exactly known for hitting the clubs drenched in bubbly even before Kai came along. However we weren't quite expecting Kai to make such an impact on our plans. Caroline and Luigi had come up from Philomath mid-afternoon and Kai and Gino were having fun cooing at and reaching for each other. Kai was also enjoying the fact that unlike her cousins Dash and Finn, Gino isn't able to steal toys from her yet or protest as much when she steals them from him. So she was able to maximize her evil machinations on the play mat. Though I think she may have been a little intimidated by the fact that he already outweighs her. All was looking good for an afternoon/evening of baby play and then nice dinner and drinks and board games for the adults, when Kai decided to throw a wrench in things. She woke up crying and distressed from her nap about 4 pm, and when Brian went in to get her she was wheezing and struggling a little to breathe. 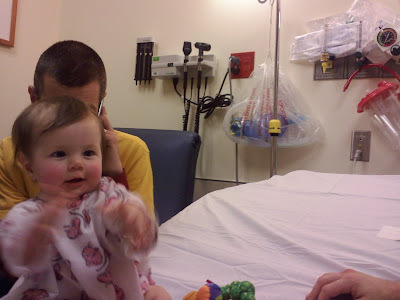 When this didn't improve right away we got in touch with her pediatrician's office, where a nurse let us know that it sounded like croup, that we needed to get her looked at, but that there weren't any doctors left in the office so we'd have to head to the ER. Luckily we live about 15 minutes from a great children's hospital. After a bit of a Keystone Kops routine (the high school students who had pulled the New Year's Eve volunteer shift at the info desk didn't know what 'urgent care' was or how to get to the ER), we were able to quickly confirm that yes, Kai was coming down with croup, but she seemed to have a just a mild case of it. They gave her some steroids to hopefully lessen the impact on her over the next two days and watched her for a couple of hours before sending us home a little after 7. 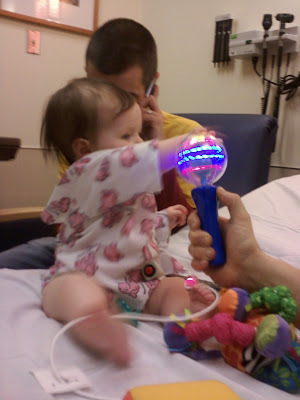 For a holiday ER trip, it was about as painless as can be. 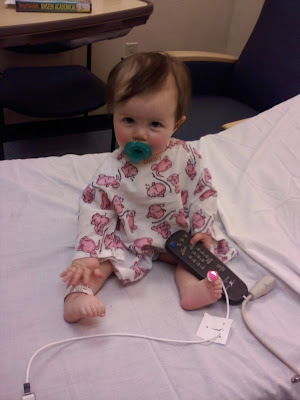 While we were there Kai modeled the latest in peds hospital gown fashion and had a great time playing with the remote control (even if she did somehow turn the TV on to Twilight, the Movie) and (when we weren't looking) the nurse call button...ooops! And a terrific volunteer came by to blow bubbles with her for awhile and to entertain her with a whirrly light wand thingy. She thought it was pretty cool. They must have been super slow that night, because not only did he stay for awhile, but he left her with the magic wand and came back and gave her a stuffed dog and a knit cap to take home with her. Score! Meanwhile, our house guests had been not only been amusing themselves in our absence, they had actually gone through our kitchen and pantry and whipped us all up a delicious - and fairly gourmet - dinner. 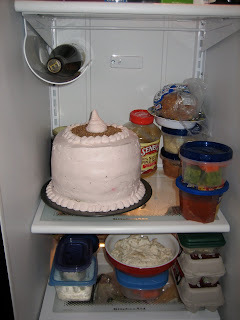 Not only that, but when we opened our fridge, we saw that we were minus a shelf but plus a death cake of goodness. 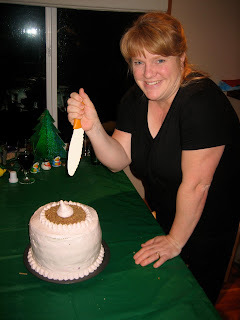 Caroline had baked up an amazing treat to welcome in the new year: a 6-layered chocolate cake, with raspberry and a marscapone/nut/whipped cream fillings. It was pretty much Death by Cake. But worth it. So despite it all, in the end we were able to celebrate the new year in our preferred fashion after all: with two relatively healthy babies, good food, fun games, and some of our best friends. If that's an omen for 2010, I'll take it.